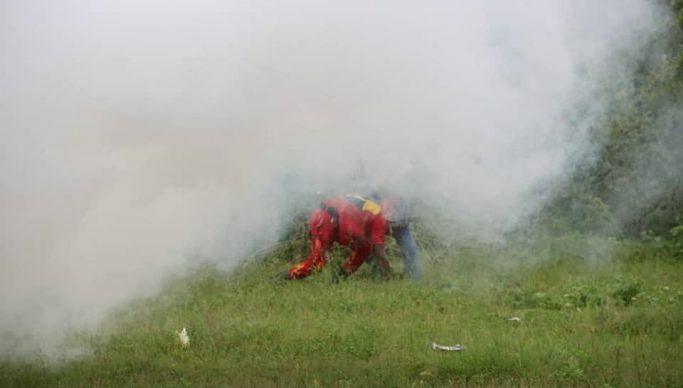 Opposition United Party for National Development president Hakainde Hichilema says lives of Zambians are in danger as police and PF cadres have continued discharging live ammunition on the innocent people in Sesheke constituency. Yesterday and today heavily armed State police continued discharging live ammunition towards Hichilema in Zambia’s Western province. And Hichilema deputy press secretary Brian Mwiinga said into the early hours of today, Hichilema endured life threatening situations from the police and Patriotic Front party cadres. Mwiinga said immediately Hichilema entourage passed through the town, heavily armed State Police came guns blazing and issuing threatening remarks that even after the same police and the Electoral Commission of Zambia granted campaign to the UPND ahead of the 12th February, 2019 parliamentary by-election. Meanwhile, unconfirmed reports says firing of live ammunition by the state police in Sesheke has left two people dead But police have claimed that no life was lost. Inspector general of police Kakoma Kanganja claimed that Zambia Police are concerned with yesterday’s happenings involving political violence in Sesheke District. He said Zambia Police have since reinforced officers on the ground to deal with any further disturbances in the area. And now the electoral commission of Zambia said following the reported incidents of electoral violence in Sesheke District, the Commission is monitoring the developments on the ground, and has encourage all political parties to comply with campaign timetables to avoid possible clashes. ECZ Public relation officer Margaret Chimanse has challenged the Police to remain professional and ensure that agreed campaign schedules are adhered to, and are conducted in a peaceful atmosphere. And the father to UPND Sesheke Parliamentary candidate Romeo Kang’ombe has died. Kang’ombe hasn’t been feeling well for quite some time and was admitted at Yeta district hospital.